New Eagles CB Daryl Worley. 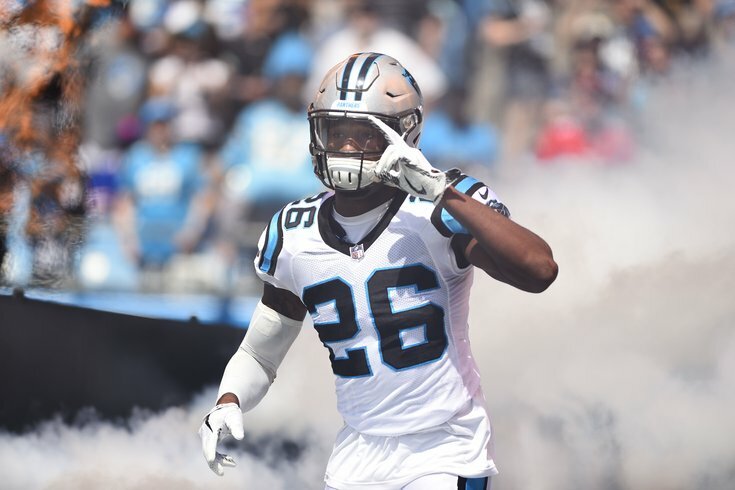 Howie Roseman and the Philadelphia Eagles' front office were at it again on Friday, when they dealt wide receiver Torrey Smith to the Carolina Panthers for cornerback Daryl Worley. This trade can be looked at from a lot of different angles, and we'll attempt to cover them all here. Why did the Eagles trade Smith? The real question to ask here is, "How in the world did the Eagles trade Smith for anything?!?" Why do the Eagles like Worley? The Eagles had Worley in to visit the NovaCare Complex for one of their 30 pre-draft visits in 2016. He went to West Virginia, a school that produced CB Rasul Douglas, WR Shelton Gibson, and RB Wendell Smallwood, who were all selected by the Eagles in the last two drafts. The Eagles seem to have interest in WVU players, though their batting average with them hasn't been great so far. Worley led the Mountaineers with six INTs in 2015, a season after picking off three passes in 2014. He has very good size at 6'1 to go along with 33.5" arms, and had good ball skills at WVU. However, he ran a terrible 4.64 40 at the NFL Combine. He also has some character concerns, in that he missed a bowl game for academic reasons, and had an off-the-field incident in which he was accused of assaulting a female. The Eagles undoubtedly investigated what happened with those incidents prior to the 2016 draft. Worley ended up getting drafted by Carolina in the third round, two spots before the Eagles drafted Isaac Seumalo. Worley's character concerns could explain his departure from Carolina, but that is purely conjecture on my part. The Eagles have more than shown a willingness to take chances on character concern players. In his two years with the Panthers, Worley started 25 games, making 152 tackles and intercepting 3 passes. So, what does this mean for the salary cap? The Eagles are projected to be about $9 million over the salary cap when the new league year begins on March 14th. So this will put the Eagles at around $4 million over, right? As we explained a week ago, because trades don't officially occur until after the start of the new league year, the Eagles will have to get under the salary cap before 4:00 p.m. on March 14th without the benefit of trades. In other words, the Eagles will still have to shave about $9 million off their cap before the start of the new league year. So wouldn't the Eagles have just been better off releasing Smith than trading him so that saved money could count toward their cap-shaving efforts prior to the new league year? Nah, the Eagles just traded for Michael Bennett, as I'm sure you'll recall. He's going to cost about $5.65 million on the cap this season, so Smith's release will mostly offset the cap charge added by trading for Bennett. Understand? OK, good. So who's the Eagles' starting wide receiver opposite Alshon Jeffery now? As PhillyVoice reported earlier this week, the Eagles hired Mack Hollins' old college coach at North Carolina, Gunter Brewer. That could certainly help his chances, though I don't think the Eagles would be wise to trust Hollins this soon as a starter, seeing as he's never had more than 35 receptions in a season, going back to his college days. The Eagles could potentially view Nelson Agholor as a starting receiver after breaking out last year. Agholor's issues his first two seasons in the NFL, when most (self included) were calling him a bust, were mental. Now that he has some confidence, a move to the outside may not seem so daunting. Then again, Agholor was great in the slot last year, so why mess with a good thing? The sense here is that the Eagles will try to add a wide receiver, whether that be in the draft or in free agency. We'll see. Should we glean anything from the addition of a cornerback, as in, what does it mean for the corners on the roster? That depends on what the Eagles actually think of Worley. He has started 25 games in his first two seasons, which is an uncommonly high number. Do the Eagles view him as a legitimate contributor on the defense? Or is he just an extra guy to bring to training camp, because the Eagles thinking was, "What the hell, we were getting rid of Torrey anyway?" My guess is that they do indeed have interest in Worley. Had the Eagles declined to pick up Smith's $5 million contract in 2018, he would have counted toward the compensatory pick formula, meaning that the Eagles might have earned a comp pick had another team signed him. Certainly the Eagles considered this, and the thinking here is that Worley was more appealing than a potential comp pick... or the Eagles think they are already going to max out at four comp picks anyway, so losing Smith didn't matter... but now I'm rambling down the nerd hole here. Anyway, if the Eagles do indeed have plans for Worley in their defense, it's worth remembering a rumor started by Chris Mortensen of ESPN earlier this week, who threw out the notion that the Eagles could be trading a cornerback for a third round pick. That scenario has a number of layers to it as well, so go read it if interested, but the Cliff's Notes version is that we landed on Ronald Darby as the most likely trade piece. So it is a good trade for the Eagles? That's a resounding yes. I mean, why not? They were going to cut Smith anyway, and instead they were able to trade him for a 23-year-old corner with 25 starts under his belt. Hell yes you make that deal.